Facebook on Tuesday announced a new tool that allows marketers to reach audiences with characteristics that are similar to existing customers they are already targeting on the social network. “Now with lookalike audiences, Facebook can use attributes like interests or demographics and show ads to people who share common attributes as their existing customers. Advertisers can serve any type of Facebook ad to these new groups of potential customers,” stated a Facebook blog post today. Based on testing over the last few weeks with direct-response companies like Fab.com, the social network said lookalike audiences are delivering “success metrics,” including lower cost per checkout and per acquisition, larger purchase size and increased ROI. The targeting option allows advertisers to expand their reach to specific geographic areas or audiences that are not already fans of a company’s Facebook page, while still maintaining the desired demographic profile of their existing audience. As with custom audiences, Facebook said it doesn’t share any personal information from lookalike audiences with advertisers. The lookalike audience feature is available starting this week in Facebook’s Power Editor tool for managing multiple campaigns and ads on the social network. 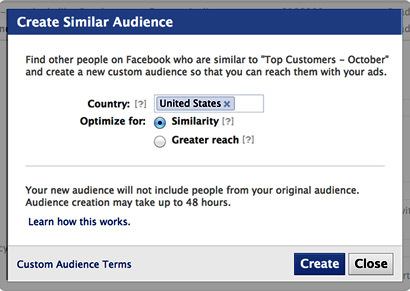 2 comments about "Facebook's 'Lookalike Audiences' Tool Aids Marketers". Mike Skladony from Semcasting, Inc., March 20, 2013 at 9:23 a.m. I live in Newark, NJ and love hanging out on Facebook. On Facebook my interests are travel, sports cars (BMW, Mercedes, Range Rover), sports, fashion and luxury goods. Oh ya, my annual Income is $25K a year. ^^how many of these exist on Facebook^^? Just because someone "likes" something on a social networking site, doesn't make them your ideal target. Paula Lynn from Who Else Unlimited, March 20, 2013 at 11:31 a.m.
Creepy, creepy, creepy. And should be illegal.